A little hill walk using forest tracks and well-marked open grassy fell paths. With a month of snow remarkably now almost a folk memory - the remnant snowfields - seen on the images in this description - are just waiting for the refreshment of the next batch of icy flakes. I took the opportunity to venture into the North-western group of fells, my primary area of research this coming season. I like to start any book research by climbing the periphery fells and move into the interior with a level of perspective, yes there is a hint of strategy in the process. The subject of this month’s walk is diminutive Sale Fell 359m/1178ft. A fine viewpoint certainly, but the pleasure is spread over a variety of scenic elements, not the least the beautiful Wythop valley. The initial ascend undertaken within the mature conifers of Thornthwaite Forest, gaining handsome views upon the lower reaches of Bassenthwaite Lake. A lovely green track leading down by the ruins of the old Wythop church to sweep over Sale Fell and pass the ‘new’ church to regain the vale. Forest Park. It forms the northernmost fell of Lakeland’s North Western group and overlooks the lower reaches of Bassenthwaite Lake. Travellers along the A66 get a close-up view of this great lake, the only true lake in the National Park, well the only one not to have a ‘mere, water or tarn’ suffix. In common with much of Lakeland, the beauty is deceptive. The fells and the lake are notoriously poor in terms of their natural history health, the waters of the lake are cruelly dystrophic. Hence the Environment Agency, from offices in Keswick, working with other agencies, including the National Park Authority and funded through the Heritage Lottery Fund are engaged in thirty environmental projects tied into the catchment of the lake in a bid to revive the natural content of the waters and associated countryside. ‘Bassenthwaite Reflections’ is the name given to this and elements of the project can be seen close to the walk. The valley of Dubwath Beck for instance is a new nature reserve re-kindling the wild life and flora in the marshy ground with a circular footpath and, for added interest, a Viking thatched hut has been built in its midst. If you visit Trotter’s Farm, behind Armathwaite Hall Hotel, you will find both Celtic dwelling and a Viking shieling reconstructions. The Dubwath (which means “the deep ford”) Nature Reserve lies adjacent to the old Penrith to Workington Railway, now converted into the new A66 highway. before you start the walk proper you may be interested to climb to the top of the Iron Age hill fort of Castle How, accessed by steps off the old main road, now a one-way slip-road off the dual-carriageway, east of the hotel. The hill-top earthworks overlook the foot of Bassenthwaite Lake, the scene of the very first sailing regatta in the district, established by Joseph Pocklington of Keswick in the 1780s. Park on the extended verge in the general vicinity of the Pheasant Hotel. This is reached off the A66 opposite the Dubwath turn, beside the old Station Cottages. At the road junction beside the hotel, head south down the road rising past the access road leading into the forest, this leads to the administrative offices of the Forestry Commission. Continue up the hill a little further and just before the first house in Routenbeck and turn left at the signposted footpath (with seat and red squirrel sign). The path gently rises in the mature forest coming above the wooden office buildings and forestry yard. Continue round the hill to take the next acute turn up right. At the top turn acutely left and then right and finally a left turn. When this too comes to a junction continue forward to a gate out of the forestry. Walkers have liberty to all the woodland tracks in Thornthwaite Forest, but it could be all too easy to keep zig-zagging and end up descending and missing the exit onto the fell. Walking through the gate follow on with the green track, one may veer right and wander pathless onto Lothwaite, a subsidiary crest, a part of the main mass of Sale Fell. The more pleasing walk, however, is to stick resolutely with the main greenway with sumptuous views about the head of the Wythop Beck valley., across to Lord’s Seat and over the woodland fringe to the great ridge of Ullock Pike supporting Skiddaw. You will notice the adjacent pasture and higher on the fell-top has what appears to be regular ridge-and-furrow markings. Is this evidence of wartime cultivation, or some kind of draining and pasture improvement cultivation? The track declines to a tall gate, set into a deer fence, protecting Chapel Wood. The woodland is an old open coppice, a lovely tangle of trunks and alive with birds - but not deer! Deer finding shelter would wreck this wild arbour by eating the bark, thus killing the trees. Exiting at the next gate come up an unexpected ruin. This being the remains of the old Wythop church built sometime in the fourteenth century and abandoned in the 1860s. Over the years each August this has been the scene of an open-air service since Victorian times. The situation shows that the Wythop Beck valley once held a strong community identity (see the photo in a case set into the end wall). Follow the track on down, when I was here a fortnight ago youngsters were tobogganing down the field off the track. Reach the road at Kelswick Farm and after the enclosure bear off the roadway onto the level green track which runs charmingly along the fellside gaining a little height latterly to meet the rising wall on the brow. One can follow the continuing track down to the road. But the finer experience is to bear up right by the odd quartz boulders climbing the ridge to the rather the plain summit of Sale Fell. One large convex slaty outcrop may attract some interest. 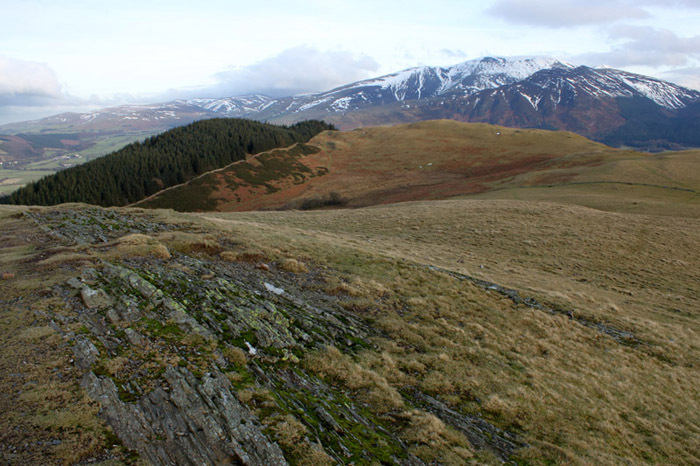 The summit, bereft of a cairn, commands wonderful outlook to the Skiddaw massif and Lord’s Seat. Cross straight on down Se to a gate and bear left to a further gate joining a greenway sloping down the fell-side and through a wall-gap to arriving at a bench where either go right to the gate onto the road or better go straight on and via hand-gates enter the churchyard of ‘new’ church built in 1866. It’s well worth a glimpse inside, to see the lovely fittings and surprising interior size, one unusual feature is that it has a north door, occasioned by the fellside situation. Pass down through the lych-gate and down the road right to complete the walk. The Pheasant Hotel, Dubwath and The Wheatsheaf in nearby Embleton. The nearest tearooms are to be found on the far side of Bassenthwaite Lake at the Forestry Commission’s Dodd Wood car park and at Little Dodd garden centre, close to Lyzzick Hall.